Balloons cakes & desserts caterers dĂ&#x2030;cor fashion floral invitations logowear music party planners photographers souvenirs venues videographers ...and much more! Exclusive access to 10 acres of unparalleled fun! Publisher : Star Trax Events Creative Director : Becca Schlussel Graphic Designer : Michael Hnatiuk Photographers : Brett Mountain Justin Munter Abby Rose Brian Masserman Jay Dreifus Paul Stoloff Digital Dan Photography Cover photo provided by Brett Mountain Photography. Rent Bumpin’ Bubble Soccer for your next event at BumpingBubbles.com or by giving us a call at (248) 885-6047. Mention StarTrax and get 10% off your total rental costs! 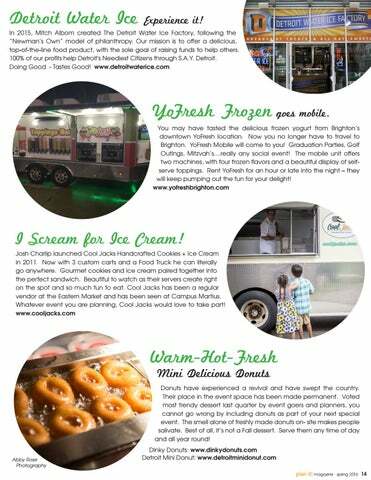 Shift your Next Event into Overdrive We can serve up our full truck service menu at your next Graduation party, WeddinG, Bar/Bat mitzvah, sWeet sixteens, corporate party or larGe shindiG. 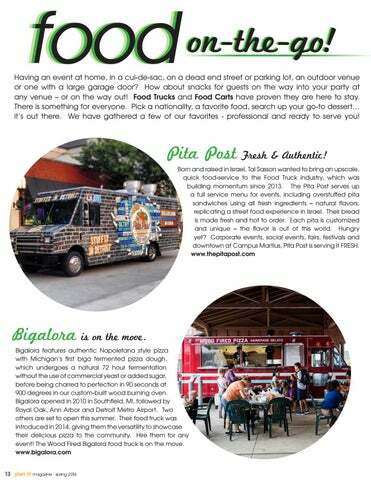 Book the pita post food truck for your next event! 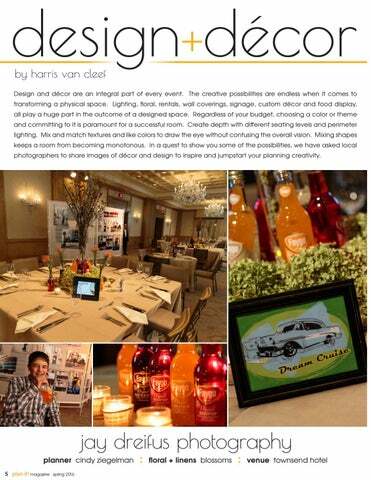 Design and dĂŠcor are an integral part of every event. The creative possibilities are endless when it comes to transforming a physical space. Lighting, floral, rentals, wall coverings, signage, custom dĂŠcor and food display, all play a huge part in the outcome of a designed space. 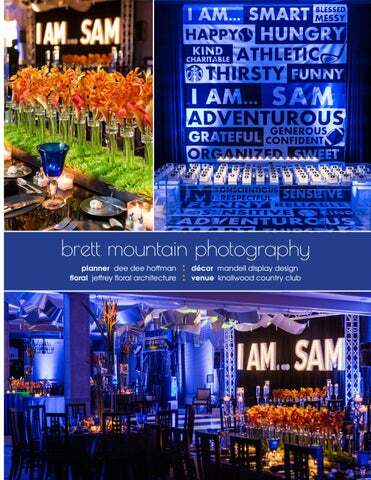 Regardless of your budget, choosing a color or theme and committing to it is paramount for a successful room. Create depth with different seating levels and perimeter lighting. Mix and match textures and like colors to draw the eye without confusing the overall vision. Mixing shapes keeps a room from becoming monotonous. In a quest to show you some of the possibilities, we have asked local photographers to share images of dĂŠcor and design to inspire and jumpstart your planning creativity. You have done the planning, now enjoy the party and leave the details to us. Our trained and experienced “Red Coat Ladies” will help you relax and enjoy your celebration with complete confidence. Your Red Coat Lady is totally ready to oversee all aspects of the day. She is prepared to handle any situation – both expected and unexpected. now enjoy the party & leave the details to us. Free Report! Brides Make & How to Avoid Them. Having an event at home, in a cul-de-sac, on a dead end street or parking lot, an outdoor venue or one with a large garage door? How about snacks for guests on the way into your party at any venue – or on the way out! Food Trucks and Food Carts have proven they are here to stay. There is something for everyone. Pick a nationality, a favorite food, search up your go-to dessert… it’s out there. We have gathered a few of our favorites - professional and ready to serve you! Pita Post Fresh & Authentic! Bigalora is on the move. 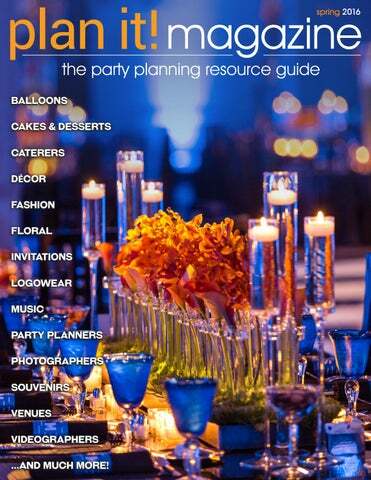 A special annual party planning guide of the Detroit Jewish News that will feature party photographs from local professional photographers plus articles on bands, parties and how-to guides. A must have for any simchah and one of the largest and most read and shared issue of the Detroit Jewish News. THE BIGALORA WOOD FIRED PIZZA TRUCK IS READY TO ROLL. Our custom-built wood fired pizza truck is the hottest thing on wheels. 900 degrees of hotness to be exact. Just the sight of us rolling up in this beast is enough to drop jaws. But imagine the joy on your guests’ faces when they experience a fresh and hot Bigalora pizza right from the oven. Now available for booking at your location of choice. Our professional Bigalora special event team can customize a menu to accommodate any size event and any size budget. Let us bring the biga to your next event. Email info@bigalora.com for more information. ANY LOCATION. ONE OF OURS… OR YOURS! Newly remodeled and with a kosher caterer on-site, Beth Ahm is the perfect place for your simcha, business function, or communal event. Whether a small, casual gathering or a large and formal function, our staff will guide you through the planning process and ensure that you and your guests have a remarkable experience. The Sparky Noodle Bakery, Co. We are a full service bakery specializing in delicious scratch made wedding cakes, celebration cakes, pastries, breads, and specialty desserts. We take pride in our creations, baking them with the same love and care as when we prepare them for our family. 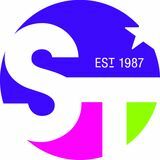 sweet 16s grad parties dj services, karaoke, catering we can turn any event into the party you dreamed of! Book your private bartender with us today. Jewish Community Center of Metropolitan Detroit The perfect location for your next event! ur elegant banquet hall, comfortable spaces for family gatherings, and meeting rooms of all sizes allow you to find exactly what you need. Options include: portable dance floor, tables and chairs, linens, audio/video needs, stage and more! The creative possibilities are endless when it comes to transforming a physical space. In a quest to show you some of the possibilities, we have asked local photographers to share images of decor and design to inspire and jumpstart your planning creativity. Food trucks and food carts have proven that they are here to stay. There is something for everyone. Pick a nationality, a favorite food, search up your go-to dessert... it's out there! We have gathered a few of our favorites - professional and ready to serve you!